The spoils. This all had to be dealt with and cleaned up. Mike arrived at my house promptly at 06:00 on the morning of the cut-out. I had everything loaded in the truck and was ready to pull out the drive. We were at the double-wide by 6:15. We set up the generator and bee-vac and I removed the access door to the crawl space. The goal was to use the vacuum to get as many bees off of the combs as possible prior to cutting them loose. Having done this several times before I can tell you I will never attempt another cut-out without a vacuum. I try to be very careful, but anytime you are removing bees form a structure there will be losses. Bees get killed so easily whether smashed between combs or drowning in honey that begins to run when you start cutting. The vacuum makes it easy to remove as many bees as possible to decrease the number of fatalities. While laying on the large piece of foam, I ran the bee-vac, attempting to make the combs accessible. Once they had been cleared I began to cut the outer sections loose. The first pieces were filled with uncapped nectar. New comb is very hard to handle especially when it has nectar in it. Much of it was destroyed by its own weight. Each time a large comb was removed the bee-vac removed bees from the newly exposed surfaces. Once the new comb was removed, older larger combs with capped honey on top, brood and eggs below. Capped honey is hard to rubber band in to the wired frames just due to weight. As a result I cut the brood and eggs loose first, placed them on the poly telescoping covers and removed them from the crawl space so they wouldn’t be damaged. The extremely clean honey was put into a five gallon bucket. 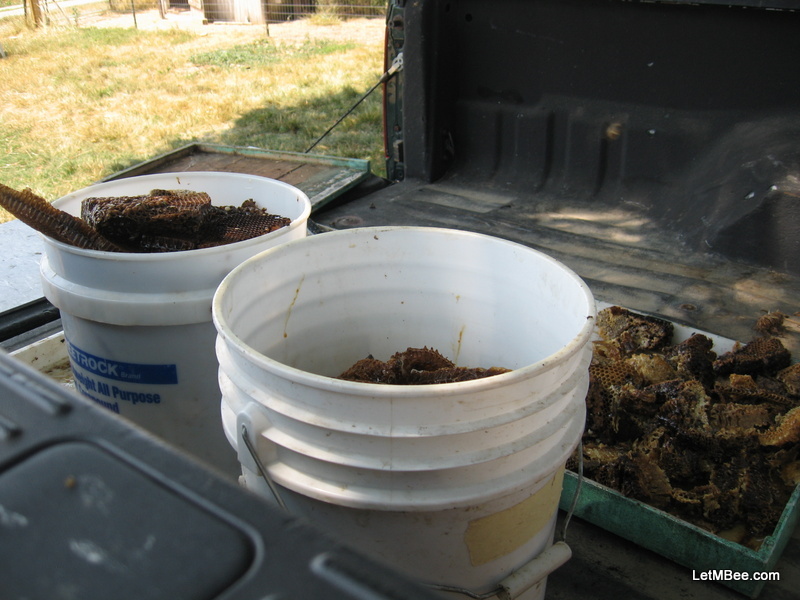 The uncapped nectar along with pieces that were soiled were placed in other buckets. Pieces of drone brood were cut away and put in the soiled honey bucket as well. This was going to be a stressful event for this colony, no need to make these girls feed a bunch of newly emerged drones when they get to their new home. It ended up taking longer than anticipated. At about 10:30 I had almost 1 entire bucket of clean capped honey, two buckets of uncapped nectar, 8 frames with brood, honey and pollen rubber banded and hanging, a bee-vac full of bees and somewhere between 20 and 30 stings. I had a considerable mess to clean up once I returned home. This was made worse by the fact that I was feeling rather bad. I think due to the stings, but it could have also been due to the heat. I just didn’t feel very good the rest of the day. Bee vacs make for MAD bees. NEVER use one without protection particularly when you let them lose. Smoke them generously before dumping them into their new hive. Without a veil I would have been in the hospital. I have never had as many bees bouncing off of me. No matter how many buckets you think you need take 2 or 3 extra. As tough as comb gets over time there is no need to my wire brood frames. I had a heck of a time separating old comb from the concrete blocks. That stuff was tough! 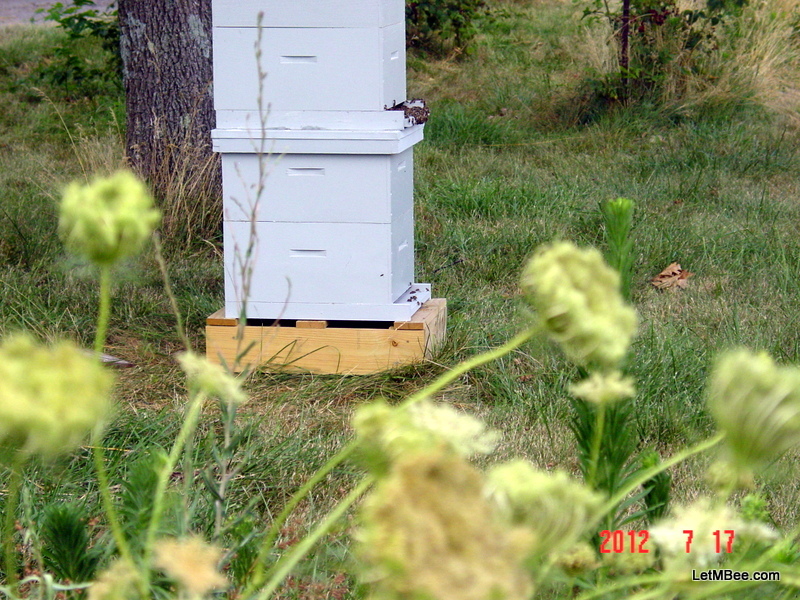 Something was blooming and the bees wanted that more than free honey, because I left the honey all out until dark. To my surprise there was no mass robbing session. You need water not only for hydration, but to wash honey off of things during and after the cutout. Take a couple wash rags. Everything you take will get sticky. I have not checked in on these bees since the move. They will be examined either today, tomorrow, or Sunday. The queen was not seen so I don’t know if she made it in the vac or not. Eggs were wired into the frames so I will be looking for new eggs, and/or queen cells once I get in there. I was planning ahead. This group was placed in a hive ON TOP of the bees from the firehouse. The firehouse bees are few in number, but queen-right. This new colonies queen status is unknown, but the bees are numerous. If the cutout LACKS a queen I will combine the two hives. I hope that this is not necessary because the cut-out bees are definitely from good genetic stock. If I have a queen in each box I will be relocating both hives to an awesome new out-yard that I obtained access to this year. I will keep you posted. Do you have any questions? anything to add? This entry was posted in Cutouts. Bookmark the permalink. Wow sounds like a large hive, I can tell you that a bucket of water it the first thing I look for, soo sticky.. After a cut-out I always feel bad, might be working in cramped quarters plus killing so many bees, idk or the heat or a combination, I don’t even like cracking open my own hives, although now that I have the comb spacing a bit further apart (8 frames / box instead of 9) it is a lot nicer with less burr and cross combing. One thing I started doing was instead of shaking the bee vac into a hive I let them crawl to the entrance by placing the open vac propped against the hive entrance. Mind you I haven’t done a cut-out this year and only one last year, the year before I did quite a few. Water is a must. I don’t like cracking open my hives unless I know something must be donee. I don’t just get in there to poke around anymore. I have had no experience before with a vac. I will try to release them as you described. Letting them go the way that I did was chaotic. I notice when it comes to bees, it always takes longer than anticipated. I noticed this year too that the our bees didn’t get upset until we broke some honey comb. I commend you, though, for doing this cut out. You could’ve left them, but you went through the trouble to house them which I think gives them more of a chance to survive.